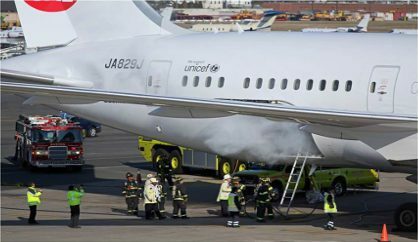 On January 7, 2013, about 1021 eastern standard time, smoke was discovered by cleaning personnel in the aft cabin of a Japan Airlines Boeing B787 registered JA829J , which was parked at a gate at General Edward Lawrence Logan International Airport (BOS), Boston, Massachusetts. About the same time, a maintenance manager in the cockpit observed that the auxiliary power unit (APU) had automatically shut down. Shortly afterward, a mechanic opened the aft electronic equipment bay (E/E bay) of the Japan Airlines Boeing B787 registered JA829J and found heavy smoke coming from the lid of the APU battery case and a fire with two distinct flames at the electrical connector on the front of the case. None of the 183 passengers and 11 crew members were aboard the airplane at the time, and none of the maintenance or cleaning personnel aboard the airplane was injured. Aircraft rescue and firefighting (ARFF) personnel responded, and one firefighter received minor injuries. The airplane had arrived from Narita International Airport (NRT), Narita, Japan, as a regularly scheduled passenger flight operated as JAL flight 008 and conducted under the provisions of 14 Code of Federal Regulations (CFR) Part 129. The captain of Japan Airlines flight JL008 reported that the APU was turned on about 30 to 40 min before the airplane left the gate at NRT (about 0247Z) and was shut down after the engines started. He stated that the flight, which departed NRT about 0304Z, was uneventful except for occasional moderate turbulence about 6.5 to 7 hours into the flight. 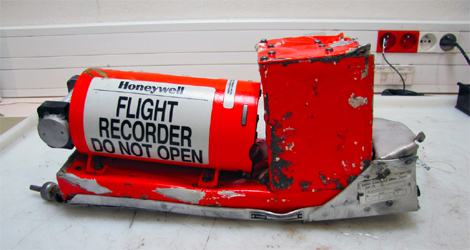 Flight data recorder (FDR) data showed that the airplane touched down at BOS at 1000:24 and that the APU was started at 1004:10 while the airplane was taxied to the gate. The captain indicated that the APU operated normally. FDR data also showed that the airplane was parked at the gate with the parking brake set and both engines shut down by 1006:54. The maintenance manager (the JAL director of aircraft maintenance and engineering at BOS) reported that the passengers had deplaned by 1015 and that the flight and cabin crew members had deplaned by 1020, at which time he and the cabin cleaning crew had entered the airplane. The maintenance manager then observed a loss of power to systems powered by the APU and realized that the APU had automatically shut down. After confirming that the airplane’s electrical power systems were off, the maintenance manager turned the main and APU battery switches to the “off” position. FDR data showed that the APU battery failed at 1021:15 and that the APU shut down at 1021:37, which was also when the APU controller lost power. A mechanic in the aft cabin at the time reported that, when the airplane lost power, he went to the cockpit and learned that the APU had shut down. The mechanic then went back to the aft cabin of Japan Airlines Boeing B787 registered JA829J and saw and smelled smoke. A JAL station manager arrived at the airplane and reported that, when he went into the cabin (through the door where the passenger boarding bridge is attached), he saw “intense” smoke that was concentrated 10 ft aft of the door. The turnaround coordinator for JAL flight JAL008 and JAL 007, who had also entered the aft cabin and observed the smoke, described the smoke as “caustic smelling.” The mechanic notified the maintenance manager about the smoke, and the maintenance manager asked the mechanic to check the aft E/E bay. The mechanic found heavy smoke and flames in the compartment coming from the lid of the APU battery case. The mechanic reported that he used a dry chemical fire extinguisher (located at the base of the passenger boarding bridge) to attempt to put out the fire but that the smoke and flames did not stop. About 1037, ARFF personnel at BOS were notified about smoke in the cabin of a JAL airplane. Review of a time-stamped airport security camera video showed that the first of five ARFF trucks arrived on scene within 1 min (at 1037:50). The other four ARFF trucks arrived on scene about 2.5 min after initial notification. A ladder truck, a rescue truck, an airstair truck, a hazardous materials truck, and a fire command vehicle also responded to the incident. The JAL mechanic advised ARFF personnel that the fire was in the aft E/E bay and led a firefighter to the aft E/E bay door. The firefighter reported that, after entering the compartment, he could see “a white glow about the size of a softball” on a hand-held thermal imaging camera. The firefighter also reported that he applied “a shot” of Halotron (a clean fire-extinguishing agent) to knock down the fire.10 The thermal imaging camera showed that the white glow was still present but was less intense than before. The airport security camera video showed smoke coming out of the airplane. An ARFF captain went into the aft E/E bay with the thermal imaging camera, which showed a heat signature near the APU battery. After he exited the E/E bay, another firefighter entered it. This firefighter reported no visibility because of the smoke. He did not know where the battery was located within the E/E bay, but he knew of a “hot spot” about 6 to 8 in ahead of him, so he discharged a “quick burst” of Halotron for 10 to 20 seconds. The firefighter exited and reentered the E/E bay with the thermal imaging camera. He reported that the battery case was visible and that he saw “a white glow with radiant heat waves” but no flames. An ARFF lieutenant who entered the aft E/E bay reported that the battery appeared to be rekindling. The ARFF captain reentered the E/E bay and saw heavy white smoke (which he had seen earlier billowing through the floor of the aft cabin) but no flames. The captain applied shots of Halotron to the fire for 5 min, which he believed had knocked down the fire. He reported that the battery was emitting white smoke, creating heavy smoke conditions. The ARFF captain also reported that the battery was hissing loudly and that liquid was flowing down the sides of the battery case. A firefighter (outside the airplane) reported that he heard a “pop” sound and saw smoke “pouring out of” the aft E/E bay. After additional firefighting efforts and the placement of a ventilation fan by the E/E bay door to clear smoke, the incident commander decided to remove the APU battery (The airport security camera video showed that, at 1105:58, smoke was no longer visible from the exterior of the airplane.) 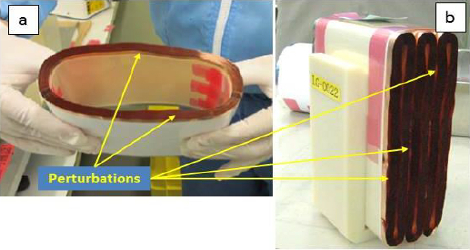 Firefighters reported that removing the battery was difficult because a metal kick shield installed in front of the battery prevented them from accessing the battery’s quarter-turn quick disconnect knob. Also, the quick disconnect knob could not be turned because it was charred and had melted away. The airport security camera video showed that the battery was removed from the aft E/E bay at 1157:20, about 80 min after the initial notification of the event. The ARFF incident report showed that the event was “controlled” about 1219 (about 1 hour 40 min after the initial notification). The National Transportation Safety Board determines that the probable cause of this incident was an internal short circuit within a cell of the auxiliary power unit (APU) lithium-ion battery, which led to thermal runaway that cascaded to adjacent cells, resulting in the release of smoke and fire. 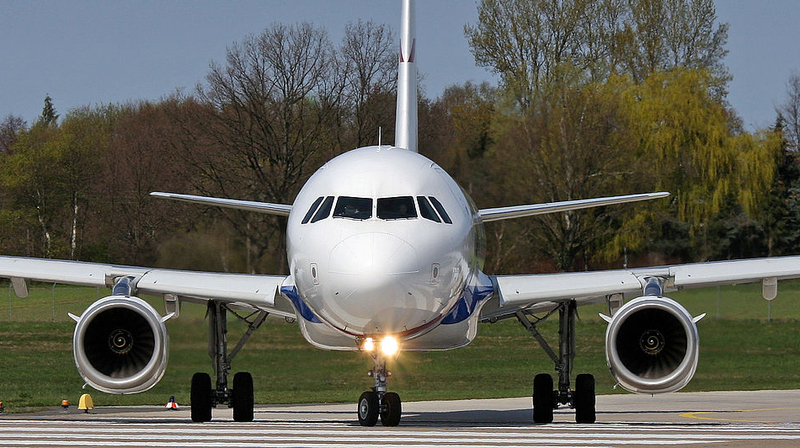 The incident resulted from Boeing’s failure to incorporate design requirements to mitigate the most severe effects of an internal short circuit within an APU battery cell and the Federal Aviation Administration’s failure to identify this design deficiency during the type design certification process .